Alone on a sandy beach. A leisurely walk on a sunny afternoon. Suddenly, spot a stranded starfish. Two weeks later. Another beach. Another leisurely walk on a sunny afternoon. This time, with our son (Let’s call him Fred). It’s hot. 34C. Wear flip-flops. Burning sand, too hot for bare feet. See washed up coconuts, dried seaweed, assorted shells and sticks and twigs. A fallen tree trunk, now a giant, sun-bleached log, rests on the sand. I rest on the log. Fred walks over and rests beside me. We watch a man on a paddle board glide into shore. Three small children run to meet him whilst their mother waits in the shade of the trees. Suddenly, Fred gets up from the log and takes several steps. He stares at something on the sand. I get up and look too. No. Only five legs. I thought it was a snake at first. The stranded creature looks hard and dry. Using a long, thin rock and a flat rock, Fred carries it to a shady part of the beach. It looks brittle and we don’t want to break it. Fred places it gently on a brown leaf. The mystery creature is beautifully preserved, I assume by the sea salt and the sun, flat and hard like a pressed flower. 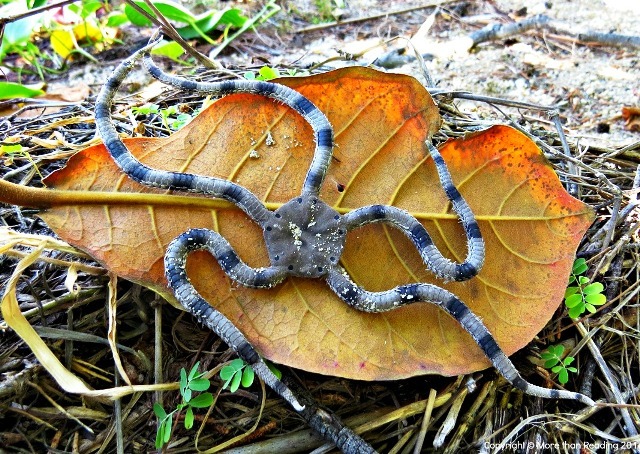 We find out later, it’s a Brittle Star – in the Starfish family. 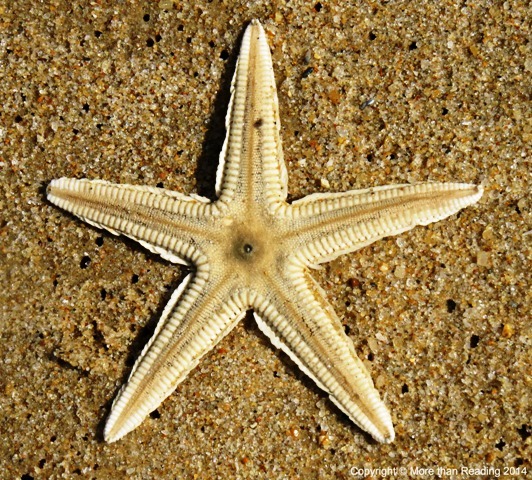 We also find out that marine scientists are trying to rename ‘starfish‘ as Sea Stars – because they are not ‘fish’.